DR12 is proud to present Felix Cumbe the Haitian-Dominican megastar of bachata and merengue. His most famous bachata song is Como Maicon, see above also. 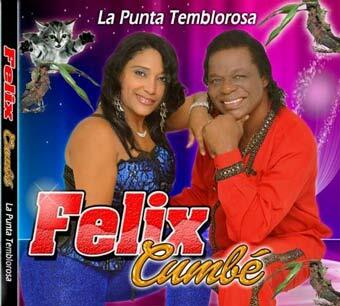 Biografia: Felix Cumbé was born in Haiti and migrated to the Dominican Republic when he was 13 years old. His musical debut took place in the 1980s with his single El Gatico written for Aníbal Bravo's orchestra. His popularity increased with the themes Félix Cumbé and Déjame Volver, which he sang along with Fernando Villalona. In 2012 he returned to the show business with Tu no ta pa mi (Y yo aquí como un ma'icón). 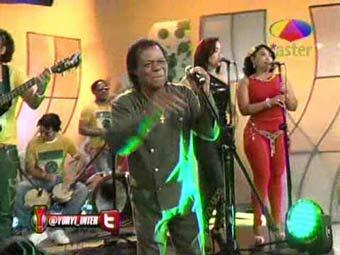 Felix Cumbe is a frequent visitor in Dominican TV programs. On top of the page you can see most of his songs presented in Extremo a Extremo program. Felix was wise in making radio and peasant version of his most famous song Como Maicon. He is actually really famous in DR and he has also done his world tour. 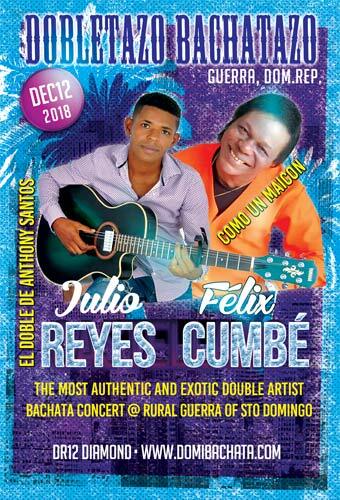 DR12 proudly presents Dobletazo Bachatarazo with two famous bachata artists, Felix Cumbe and Julio Reyes, in a barrio club at rural Guerra city near Santo Domingo, Dominican Republic. It will be your most authentic and exotic bachata experience of your life. During the DR1-DR11 Bachata Festivals we have visited various times in Guerra. The first BachataTour video has already 184 000 visitors. DR3 had a wonderfull 3 clubs 3 live bands Bachata Tour in Guerra. Bachata Ambassador is proud of being able to offer Palo concert several times in Guerra. We don't know any other bachata festival of being able to offer Palo concerts, workshops and dancing. Amazing experiences.